A big part of the 2015 Stanley Cup Final has been the battle between 2013 Cup winner Corey Crawford of the Chicago Blackhawks and Ben Bishop of the Tampa Bay Lightning. Bishop returned for Game 5 after missing Game 4 with an unspecified injury. NHL.com scouted the goalies before the series and is tracking their performances each game, identifying attack trends and shot quality. Kevin Woodley, managing editor of InGoal Magazine, uses Double Blue Sports Analytics software to chart goals and shots in each game. 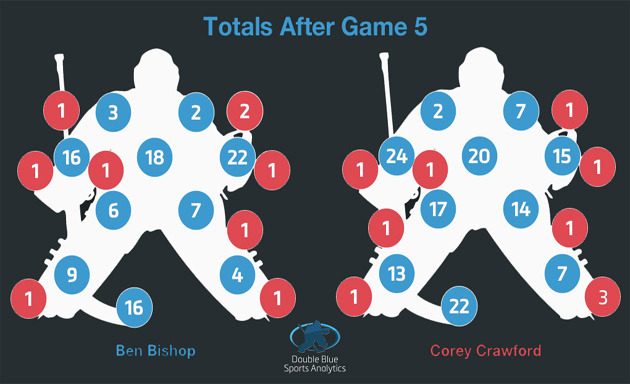 Here are his findings from Game 5, a 2-1 victory by the Blackhawks. The Chicago Blackhawks didn’t get as many shots on Tampa Bay Lightning goalie Ben Bishop in Game 5 as they managed when he was clearly hobbled in Game 3, but they did a much better job of making the big goalie move laterally more often. Five of Bishop’s 36 saves came off lateral passes in Game 3, but after sitting out Game 4 to rest an undisclosed injury that seemed to cause him the most discomfort moving side to side, the Blackhawks welcomed him back to the crease by forcing him to make eight of his 27 saves in Game 5 after lateral passes. After seeing 20 clean shots in Game 3, Bishop faced 11 clean looks Saturday. The Blackhawks also did a better job of testing Bishop’s mobility by shooting from bad angles to test his post play. Despite Bishop's post integration appearing visibly painful before he exited Game 2 and through much of Game 3, especially when he used his reverse-VH save technique on the blocker side, Chicago only tested him from dead angles four times in 38 shots in Game 3. In Game 5, they threw seven of 29 shots at the net from sharp angles, forcing Bishop to move into and off of his posts more often. Bishop is aggressive for his size, preferring to play at the edges of his crease and beyond, and Chicago had 10 one-time shots in Game 5, giving him less time to get set after moving. Bishop used his aggressiveness effectively a couple of times while Tampa Bay was being outshot 9-1 early in the game, getting well outside his crease to deny defenseman Duncan Keith and controlling the rebound. Positioning and quick shots from the Blackhawks may have played a role in some of the 15 rebounds Bishop gave up, but the goalie put more than half of those into safe areas, and did a good job controlling tough chances completely with either his glove or with body saves that smothered the puck. Chicago goalie Corey Crawford was busy at the other end for a second straight game. Of his 31 saves, six came through screens, four involved a deflection, six were off lateral passes, and eight were off one-timers. Chicago, however, did a better job of keeping the Lightning attack on the perimeter in Game 5. Eleven of Tampa Bay’s 32 shots came from inside the “home plate” area, which extends from the edge of the crease to the faceoff dots and up to the top of the circles. Crawford faced three chances across the "Royal Road," an imaginary line splitting the offensive zone below the top of the faceoff circles. Introduced by former NHL goalie and current MSG analyst Steve Valiquette, the Royal Road helps identify the toughest chances because shots from that area of the ice force a goalie to turn and reset his angle. The Lightning scored their goal on a Royal Road chance, with a great cross-ice pass by Jason Garrison leaving Crawford with too much space to recover as Valtteri Filppula corralled the puck. 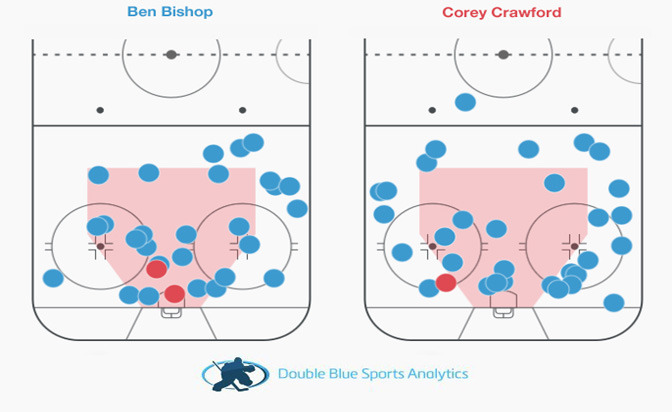 At the other end, Bishop saw more shots from inside the home plate area, including 15 from below the top of the faceoff circles and 10 from the more dangerous zone in the middle of the ice. But Bishop only needed to deal with two chances across the Royal Road. Any discussion about how healthy Bishop is should probably also include his puck-handling tendencies. After 19 touches in Game 1 and 13 in Game 2 before leaving because of the injury, Bishop played the puck four times in Game 3. That number was back up to 15 times in Game 5, and although the Lightning will lament the miscommunication that led to a collision with defenseman Victor Hedman and an empty-net goal for Blackhawks forward Patrick Sharp, 10 of Bishop’s touches led directly to a controlled zone exit for the Tampa Bay attack. Blackhawks fans may have a more legitimate concern with Crawford handling the puck. He had six touches in Game 5, but several were adventures, including one turnover that forced him to make a diving save with his blocker after giving the puck away to Lightning forward Nikita Kucherov. Chicago only got out of its zone cleanly on two of his six touches, and one occurred when Crawford simply left the puck behind the net for his defenseman during a power play. For all the talk about Crawford’s glove over the past few years, the Lightning again fired more shots at his blocker in Game 5, part of a slight trend toward that side overall in the Cup Final. It may not be a big discrepancy, and the circumstances and spot on the ice often dictate where a player can shoot, but if nothing else it should be easy to dismiss any talk of Crawford’s glove being targeted in this series, even if that narrative may never go away completely. Steven Stamkos did try the glove on a great one-time chance off a same-side lateral pass in the high slot three minutes into the third period, but Crawford got his glove up while moving the other way. 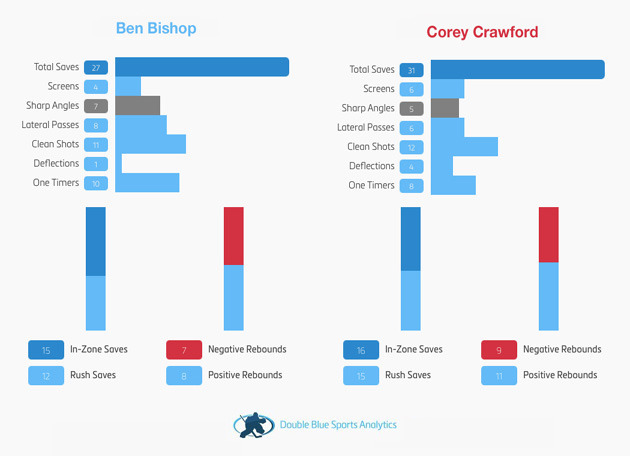 The Lightning did continue to attack Crawford from sharp angles, which has led to several goals in the series, and those five shots led to many of his 20 total and nine negative rebounds. Overall, though, Crawford was sharper in his use of post-integration tactics for a second straight game, again using his backside skate edge to push himself up into high shots while using the reverse-VH technique, rather than passively dropping his lead pad to the ice and leaning over that leg to seal the short-side post with his body. 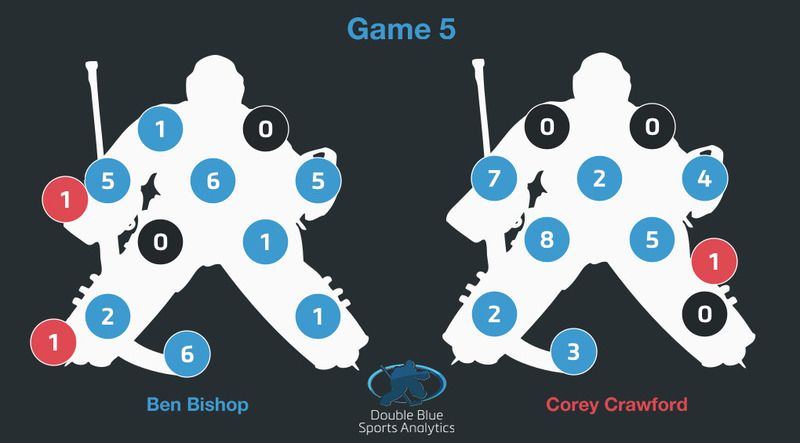 As for Bishop, there were more Game 5 shots directed at his blocker side than his glove, which he used to make some of his best saves of the night, including on Andrew Desjardins in the slot midway through the third period. Overall, the shots only slightly favor Bishop’s glove side, with 27 (and three goals) compared to 22 (and three goals) on the blocker side so far in this Stanley Cup Final.